In the world of fermentation, you will often hear talk of probiotics (living microorganisms that confer health benefit when consumed and maintained in healthy balance) and the health value that they add to our diets. What we don’t hear much about, however, are prebiotics. In my opinion, prebiotics are even more essential in promoting digestive health than probiotics. I know this may seem a little sacrilegious to utter in fermenting circles, but hear me out. Ingesting probiotics is great, but we also need to actively feed those probiotics and prebiotics do just that. Sowhat are prebiotics? Let’s start with the basics…. Prebiotics are typically food fibers that our digestive enzymes don’t break down and thus are able to travel to to the large intestine where they act as a food source for the beneficial bacteria (probiotics) that live there. Prebiotics effectively induce the growth and well being of probiotics. Put in simple terms as relates to our digestive system, we can consider prebiotics as food for our probiotics, promoting a healthy population and balance of good bacteria in our digestive systems. The microbes in our colon do all the work of digesting the prebiotic fibers yet we benefit extensively. Some prebiotic fiber is insoluble and some is soluble. Soluble fibers are fermentable and act as food for the probiotic bacteria in our lower intestine. These prebiotic soluble fibers are commonly found in oats, seeds, nuts, fruits, vegetables and beans. Since they are not digested by our own body’s enzymes, soluble prebiotic fiber passes through to the lower intestine serving as food for the microorganisms (probiotics) in our bodies. Foods especially high in prebiotic soluble fiber include chia seeds, flax seeds, coconut flakes, onions, garlic, asparagus, dark green leafy vegetables and beans. Insoluble fibers, with the exception of resistant starches, do not absorb water and thus remain largely intact as they make their way through our digestive system. Examples of foods containing a high proportion of insoluble fiber include celery, carrots, nuts, whole wheat bread, brown rice, and fruit skin. Insoluble fiber does not ferment in the lower intestine or act as food for the microorganisms in our digestive system. They are primarily bulking agents and their consumption helps keep our digestive system regular. They also serve as a transport mechanism in carrying ingested healthy probiotics to the lower intestine. Resistant starch is an insoluble fiber, but unlike other insoluble fibers, can serve as food for our digestive flora in the lower intestine. Resistant starches can be found in whole grains, nuts, potatoes and beans. 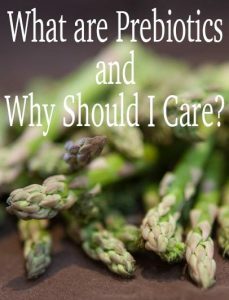 Why do I need Prebiotics? The most important function that prebiotics play is in providing food to the probiotics in our gut. We may decide to take probiotic supplements, but without feeding those probiotics, they will not thrive and thus our gut remains out of balance. Probiotics need a food source to survive and flourish, and the soluble fibers we consume provide that food source. Cholesterol and Cardiovascular Disease – LDL cholesterol particles (the bad ones) attach to soluble fiber and are removed from the body and thus overall cholesterol levels can be reduced leading to better cardiovascular health. Studies have also shown that people who eat a high-fiber diet have a 40% lower risk of heart disease. Diabetes – Since soluble fiber is not so readily absorbed, breakdown of carbohydrates and absorption of sugars can be slowed, limiting sugar spikes in our blood. Higher fiber intake can thus help prevent type 2 diabetes. For those who have type 1 and type 2 diabetes, consuming soluble fiber can help keep it stabilized. Weight Loss – Blood sugar spikes (which can be avoided by eating high-prebiotic content foods) can lead to cravings of unhealthy foods, leading to weight gain and general immune system weakness. We also feel more full when we eat fiber and thus tend to eat fewer calories, which can lead to weight loss. Higher fiber foods tend to be lower in calories as well. Perhaps most importantly, adding more fiber to our diets can shift out microbial profile from one associated with obesity to one associated with a more slender frame. see recent post: How to Lose Weight and Keep it Off by Eating Fermented Foods. Digestive System Health – Studies have shown that increased fiber intake has been positively associated with reduced risk of Irritable Bowel Syndome (IBS), ulcerative colitis, constipation, Crohn’s disease, diverticulitis, hemorrhoids, ulcers and gastric reflux (GERD). Ingesting dietary fiber can have a strong general impact on healthy aging. In a study of over 1500 individuals over the age of 50, according to the lead author of the study, “Out of all the variables that we looked at, fiber intake — which is a type of carbohydrate that the body can’t digest — had the strongest influence… Essentially, we found that those who had the highest intake of fiber or total fiber actually had an almost 80 percent greater likelihood of living a long and healthy life over a 10-year follow-up. That is, they were less likely to suffer from hypertension, diabetes, dementia, depression, and functional disability.” It’s hard to argue with that kind of data. There is one caveat to the ingestion of prebiotics. When there is a preponderance of unhealthy more pathogenic bacteria in the gut, as evidenced by diarrhea, leaky gut, food allergies, and excessive flatulence, it might be advised to go on a GAPS (Gut and Psychology Syndrome) diet which limits the intake of fiber for awhile in order to first starve the unhealthy micro-organisms in the gut and then repopulate with probiotics while slowly reintroducing more fiber. More information can be found in the book Gut and Psychology Syndrome by Natasha Campbell-McBride and or Heal Your Gut, Change Your Life. 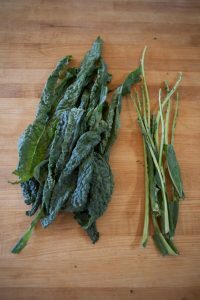 Where do I get Prebiotics? 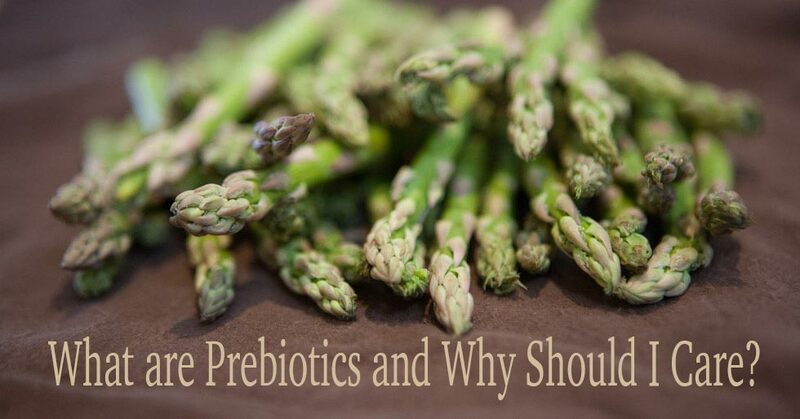 So where do we get prebiotics? The answer is simple – from food! But when I say “food,” I mean what I would term as “ real, healthy food.” The western diet for many is so full of meats, dairy and sugars, all of which contain no prebiotic fiber, that our intake of naturally occurring prebiotic fiber is much lower than it should be. As such, our digestive systems are often unhealthy and we fail to achieve a healthy balance of beneficial probiotic bacteria in our gut. So what is “real, healthy food?” Real, healthy food comes from the earth and is eaten as closely as possible to it’s natural state. Beans, nuts, seeds, vegetables, fruits, whole grains such as brown rice, oats, barley, rye, buckwheat, quinoa, whole wheat can all be considered real, healthy food. You can get pre-biotics and probiotics from supplements, but not only is it generally not necessary, you are better off getting your prebiotics and probiotics from real, healthy food. Can I get Prebiotics from Fermented Foods? The answer is a resounding “Yes!” Fermented vegetables such as sauerkraut not only have live probiotic cultures, but they also have the the pre-biotic fiber of the underlying food which feeds the probiotic microorganisms and also serves to transport it to the large intestine where it can thrive and support a healthier digestive system. In conclusion, while ingesting probiotics can help to bring our digestive system into a healthy balance, we need to actively provide food for those beneficial microorganisms, and that food comes in the form of prebiotics, commonly known as dietary fiber. Since fermented foods contain both probiotics and prebiotics, consuming them provides a healthy mechanism for developing and maintaining a healthy and balanced digestive system.